One of the first posts we did on BHB back in 2006 was a photo of a banged up car with the words “It’s Art if You Want It to Be” spray painted on its side. Mrs. Fink snapped this shot of another “art project” over the weekend on Pineapple Street and it made us all nostalgic and stuff. 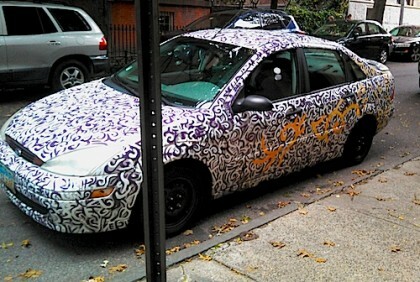 UPDATE: A Brooklyn Bugle reader has revealed the name of the artist who painted the car.